Thomas “Cornflake” LaManna, 21-1, 9 KOs, held an open workout for the media today at the Joe Hand Boxing Gym in Philadelphia. 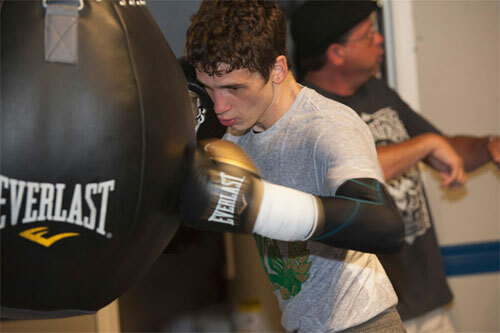 LaManna meets Dusty Hernandez Harrison, 29-0-1, 16 KOs, in the main event of an eight-bout card at South Philly’s 2300 Arena on Thursday night. Their bout, and three others, will also be nationally televised by CBS Sports Network. Although Thursday’s 10-round bout for the vacant USBA welterweight title will be the first time the two have officially faced off, LaManna and Harrison sparred together about three years ago in Washington, DC. That experience in the gym, with headgear and big gloves, has given LaManna some insight on his opponent, and he says he knows what not to do against Harrison when they meet on Thursday. LaManna will try to establish the momentum at the opening bell, but knows he has time to get things under control. LaManna is riding a five bout winning streak. Harrison is undefeated, but settled for a draw in his last bout, the only smudge on his 30-bout record. However, LaManna is looking to issue Harrison his first-ever loss. LaManna completed a light workout today and said that most of his preparation for the fight was finished.